Friday seems like a very long time ago. Many things changed over the course of the weekend, including the weather that messed up our loud, dusty, chop saw action. But don’t worry: we found something else to do on Sunday. The family room (aka: the Lounge) is a big room with a high, beamed ceiling, a sliding glass patio door, a space for a television, a giant olive green sectional, a dark wood coffee table, a huge floor lamp that arches over the sectional, and the Mad Men favorite, a wet bar. It’s pretty groovy since we spruced up the white trim and previous owner’s beige walls with bright orange walls behind the tv and the wet bar. It’s bold and some might say, brave. In this house, we are not afraid of color at all, especially if it’s takes the brain back in time to somewhere around 1966. We’ve been debating what to do about the patio door. When we moved into the Mortroski Midcentury, only one window had any covering and that was in our bedroom. We quickly put up paper blinds (slightly classier than sheets) and started shopping for something more permanent. Now, we have some non-descript, but very useful, blinds throughout the house. But we wanted something more special for the Lounge, especially since the window covering would be mostly for decoration (we plan to keep the curtains open most of the time). Originally Bruce’s plan was to make the curtains from scratch. You know spin the thread, hand dye it with plants we grew ourselves on the Urban Farm, weave the fabric, etc. Just kidding. We were going to look for some fabric, fire up Morty (that’s the sewing machine’s new name, thanks to Fransi), and get to it, hoping for the best. But then, Bruce saw what he thought would help to tie the room together—and secretly he knew that curtains would be the catalyst to convince me that painting the fireplace brick was a good idea. So Saturday afternoon we headed over to SMU-land to visit West Elm. Guess what: the original curtain selection didn’t look so hot in person. 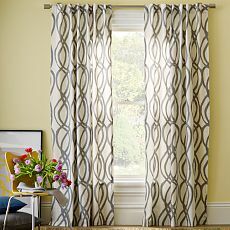 But all the curtains and rods were on sale and they had a huge selection of curtains in store. We found a pattern that we really liked and would work well with the room color and furnishings…and a newly improved dark gray fireplace. the chosen curtains, though not in our Lounge. Morty is still going to get pressed into service. He’s going to have to help us to join two panels to make a larger curtain for each side of the patio door. And he’s probably going to be doing some hemming. But the rod we wanted was out of stock so I had to order it online when we got home. Hopefully it comes by the weekend and we can finish our Lounge upgrade. Curtains in hand, we headed over to one of the big box home improvement stores that we should have purchased stock in several houses ago. 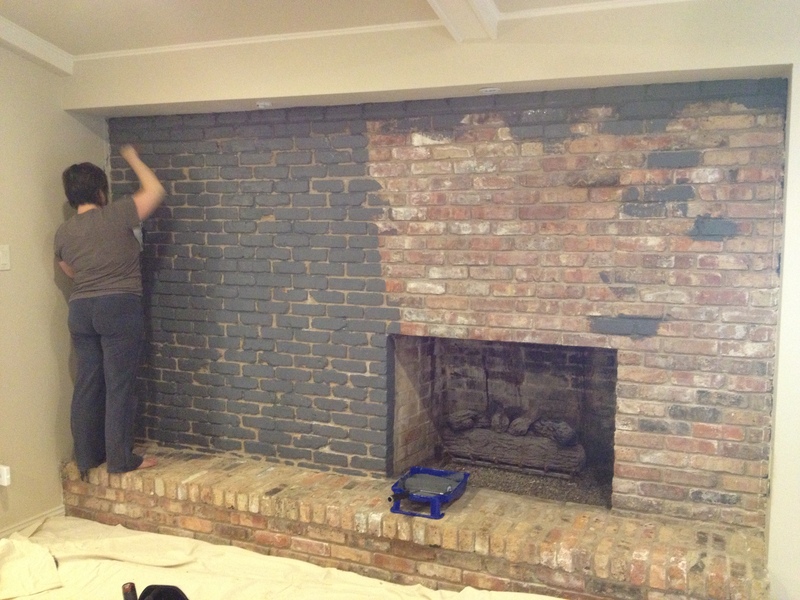 Shockingly, we found several paint options for the brick very quickly—and a great paint option for our home office. We didn’t purchase paint, however; Bruce prefers to bring a canine companion to amuse the other patrons waiting for paint to get mixed and none of the 3G Network was along for the ride. Besides we had to tape the little sample card to the wall and look at it and make sure that we were ok with the big (and scary, to me anyway) thing we were about to do. Sunday, Bruce and George (he’s yellow goofy one) headed off to Lowes to pick up the paint while I scrubbed at the brick and vacuumed up dust, debris and disgusting stuff I’d really rather not think about. 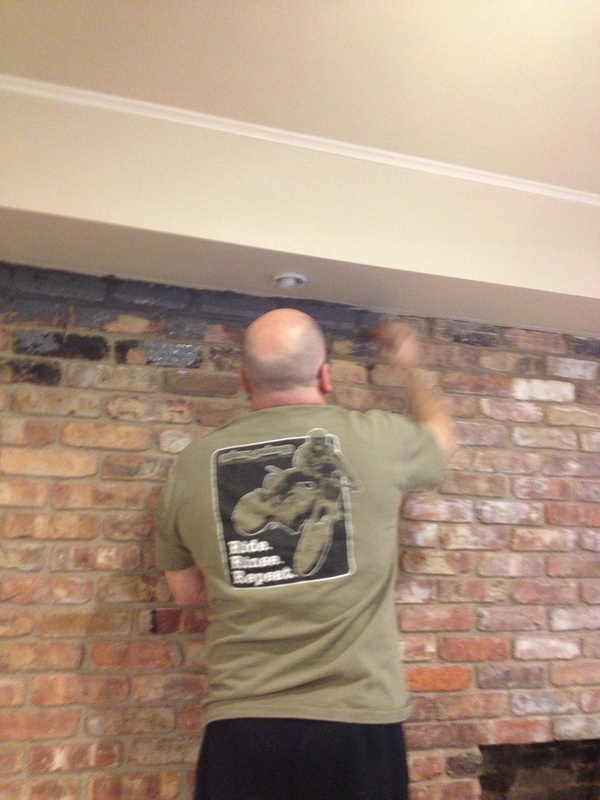 If you have exposed bricks, you may want to take the vacuum and a brush to them occasionally. Or not. 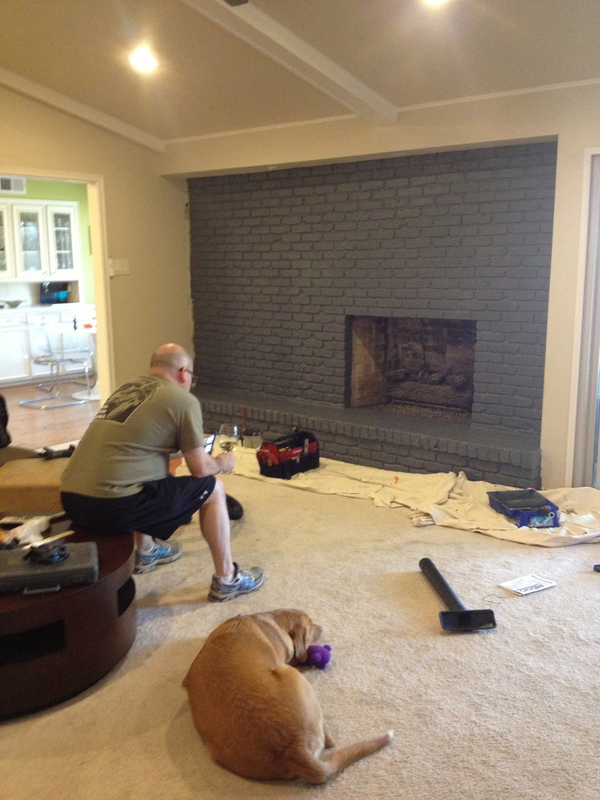 You may be wondering, “Why the heck are they painting perfectly good brick?” Simple: it’s not perfect and it doesn’t look as good as I had hoped. We left it as it was for about 1.5 years as we decided what to do with it. Or rather as I decided that I’d go along with Bruce’s original plan that he mentioned the minute he saw it as our real estate agent escorted us around the inside. It is the brick of many colors: red, gray, light gray, black. And as you can see from the photo below, there is no rhyme nor reason for its color pattern. I’d like to say it’s charming, but it’s not. After Bruce cut in around the edges and rolled the first section, it was my job to paint the lines (the mortar). Definitely not as fast moving as you might think, especially with bricks with lots of chips and holes and nicks and mortar which sometimes also filled with chips/holes/nicks. I don’t usually time our projects, mostly because as everyone who has ever done any DIY project, if you think it will take 2 hours, it will certainly take all day. I’ve done enough projects to know that you really shouldn’t have any plans later in the evening (although we did, doh!) because sometimes you won’t be showering off the sawdust/paint/grout/metal shavings/dirt/etc. until well past the normal dinner hour. But in this case, despite running out of paint because I used up too much filling in the lines and Bruce having to make a run back over to Lowes, this time with Guinness (that lazy lab lays down majestically in the paint department like it’s his home away from home), we knocked the whole thing out in around 3 hours including prep. Give or take. Not bad for a Sunday afternoon that turned out to be fairly sunny and nice despite the weather folk’s best predictions. It would have actually been an ok day to execute our original plans. We spent a fair chunk of last night admiring our handiwork as we flipped around the tv and tried to find anything to watch besides the horrible Grammys (sorry LL Cool J, I love you to pieces, but the show was awful). And when we woke up this morning, we still liked it so we know we did the right thing. Tonight, there is still a bit of work to be done. We need to seal the edges, add a bit of insulating foam, and caulk. We’ll need to touch up the beige walls in a couple of places where we were overzealous with the gray paint. And of course, we need to get Morty out and get the curtains ready. But that can wait until next weekend: I have a wine bag to make before Thursday. Maybe tonight’s the night. This entry was posted in So and tagged 3G Network, bricks, curtains, DIY, dogs, George, Guinness, Julie Petroski, Mortroski Midcentury, painting brick, sewing, sewing machine, Texas, urban farm, West Elm. Bookmark the permalink. Love it! Can’t wait to see in person!! The brick looks amazing! Very well done. There’s nothing like putting your own stamp on a room you’ve created yourselves. Every time someone compliments the room they’re really complimenting both of you! Yes, we did consider covering it with a variety of materials, but thought this was the best (and most cost effective) solution. 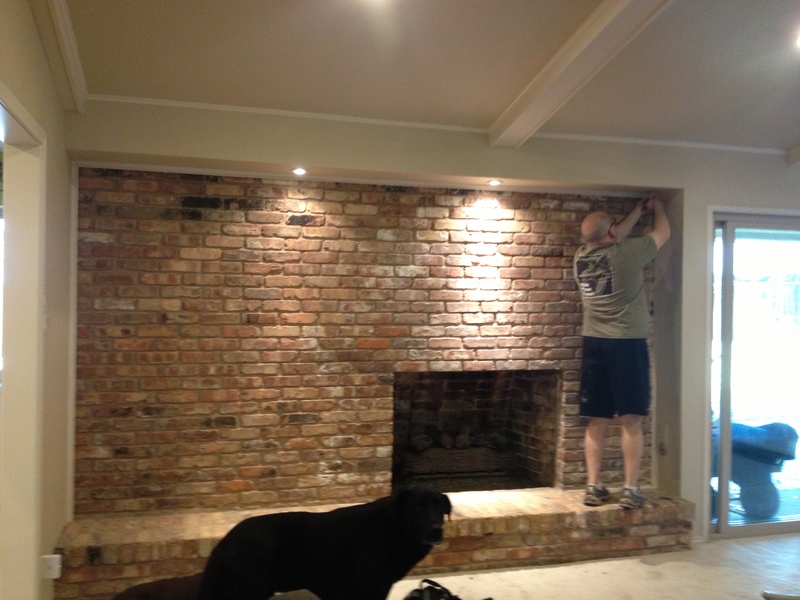 We actually like the texture of the brick, just wanted to make it more consistent and turn the fireplace into a more dramatic focal point.